La Plata County Jail detainees from left, Nate Woody, Trey Bienson, Tanner Duff and James Bradley II, fill sandbags on Friday at the La Plata County Sheriff’s Office warehouse in Bodo Industrial Park. The sandbags will be taken to residents who need to guard against flooding from the 416 Fire burn area. La Plata County Jail detainees from left, Trey Bienson, Nate Woody, Tanner Duff and James Bradley II, load sandbags on to a truck on Friday at the La Plata County Sheriff’s Office warehouse in Bodo Industrial Park. The sandbags will be taken to residents who need to guard against flooding from the 416 Fire burn area. 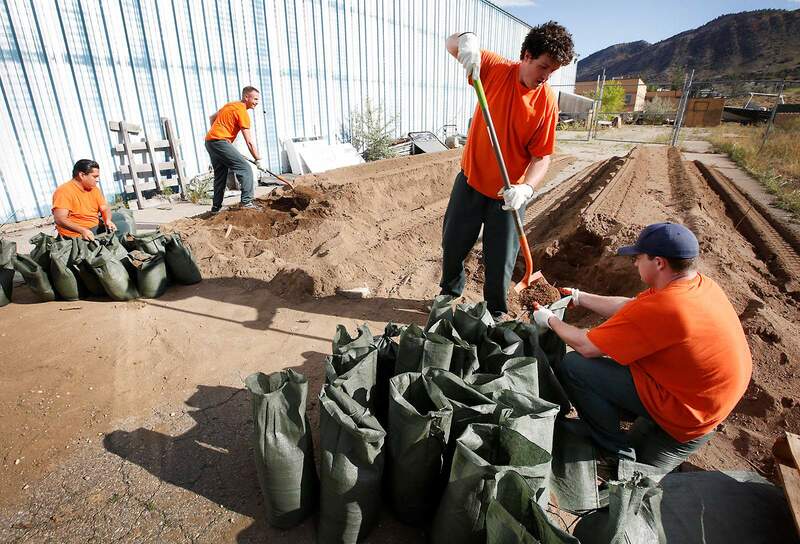 Inmates at the La Plata County Jail are assisting in a new service to help bring sandbags to residents whose homes are at risk of flooding from heavy rains on the 416 Fire burn scar. 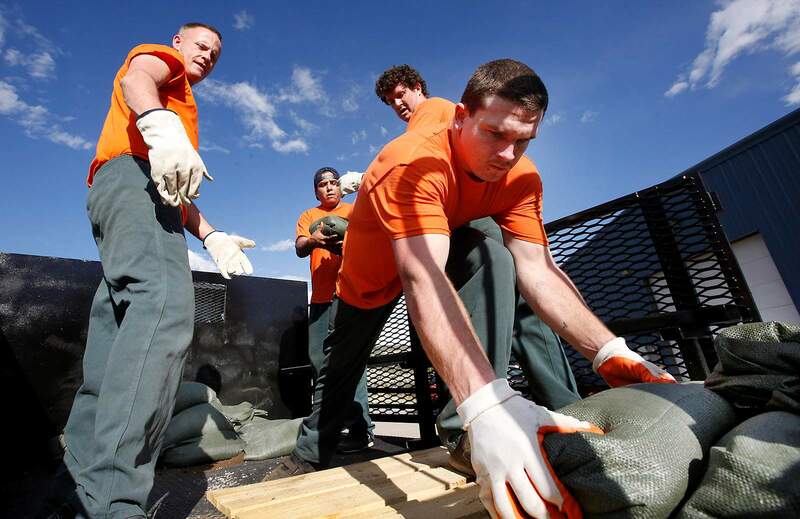 La Plata County Sheriff Sean Smith said the sandbag-filling service is part of the jail’s trustee service, in which trusted inmates can earn time off their sentence for work. Smith said trustees are nonviolent offenders who have earned the trust of jail officials to participate in the program, and trustees are always under supervision of deputies while they are working. Work done by trustees more familiar to the public would be trash removal from the sides of roads and highways. Trustees have also been used to clean up at vacated homeless camps, he said. Soil damaged in a wildfire can no longer absorb water, so when it rains, there is an increased chance of flooding, mudslides and debris flow. This has been the case for residents north of Durango whose homes are below and in the path of drainages up in the mountains that burned in June and July during the 416 Fire. Rainstorms over the past few weeks have created mudslides and flooding that have extensively damaged property. It is a problem that could last years. Sgt. Ed Aber said the Sheriff’s Office has been working to get sandbags to residents for the past couple of weeks. About 80,000 pounds of sand was donated by Elam Ready Mix-Sand & Gravel, which recently purchased the Sandco gravel pit in the Hermosa valley, Aber said. The county had obtained bags for the sand. Jail inmates bag the sand, load it onto trucks, deliver it to property owners and unload it. Strategic placing of the bags is left up to the homeowner, Aber said. For inmates, the benefits are twofold, he said. “Our inmate workers have the opportunity to get out of the jail and do some work to give back to the community,” he said. Also, inmates can accumulate 12 days a month of good time for the work, which could come off their sentence, he said. About four to eight inmates helped last week deliver 530 sandbags to residents north of Durango. The first delivery was 105 sandbags on Thursday to three locations on County Road 203 that were affected by flooding. Jimbo Buickerood, whose home is in the flood zone of Tripp Creek, said there have been about five instances where floods threatened his and his neighbors’ homes, though so far, there has been no serious property damage. “But we’re going to have more events,” he said. Buickerood said the sandbags will be used to build a sort of mote to reroute flooding from his home. “They’re (the sandbags) are going to be a huge help,” he said. On Sept. 7, inmates delivered 425 bags to a condominium complex near the KOA Campground, an area that has endured some of the worst flooding. “We’re going to use them to build a barrier so it doesn’t happen again,” said TJ Hermesman, a Durango representative with Team Rubicon, a group of veteran volunteers helping with flood damage recovery. Aber said the sandbags are a good tool to help reduce flood risk. To obtain sandbags, email Edward.aber@co.laplata.co.us or call his office at 382 7068.
jromeo@durangoherald.comHerald Staff Writer Patrick Armijo contributed to this story.